I had known Berlin through weekend trips while living in Potsdam in the summer of 1998. Berlin was undergoing massive changes in preparation for its reinstallment as the capital of the united Germany. It touted itself as the largest construction site in Europe. With a massive population of 3.5 million and a wealth of cultural and entertainment opportunities, the place was buzzing around the clock. Better yet, I found an apartment in the former East Berlin, where most of the changes were taking place, and my job was located only footsteps away from the famous Brandenburg Gate. 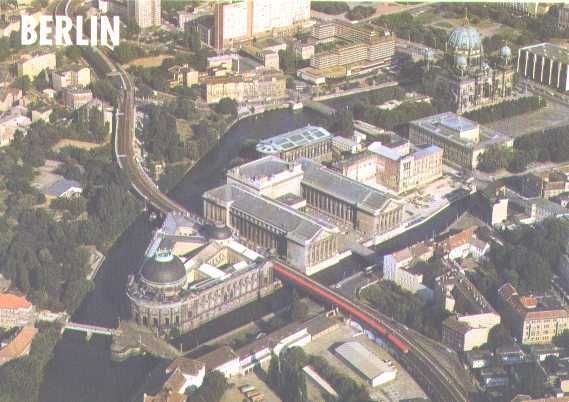 The Berlin Mitte district with the Spree River, Museum Island, and Berlin Church (blue dome). My institute is the building with the red-tiled roof at the bottom left corner! It would be impossible for me to write about my entire Berlin experience because my stay spanned one year. Many things were a novelty for me as a North American. I visited a million places, most of which would probably not interest you. I was not too thrilled about my job after a few weeks, but the perks of living in an European metropolis more than compensated for this boredom. I would write my own adventures every weekend. I had all the time in the world to explore each cranny nook in this sprawling city. The amazingly efficient trains of the Deutsche Bahn were at my disposal if I felt like running off to another city or even country. I had no intention to hoard all my income and bring it back to Canada. As I said to my coworkers, "What good is the Deutsche Mark in Canada?" They often joked that I was seeing more of Germany than they ever had in their lifetime. Time was on my side. I did not have to be accountable to anyone. I not only moved to a foreign country but my life also entered a whole new world because I was living alone for the first time. I could pack up and leave whenever I felt like it. I could leave my apartment in a complete mess and party all night and all weekend if my heart desired, which happened frequently at first because the thought of it was too good to pass by. Who cares about the tedious work at the lab? My mission was to enjoy myself and leave Germany with no regrets. 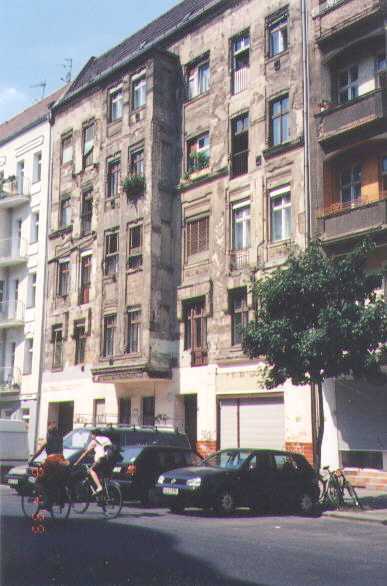 My apartment building in Prenzlauerberg, former East Berlin. The WWII bullet holes typically seen on the walls in this neighborhood can be deceiving because the area is undergoing significant changes and quickly becoming one of the trendiest residential areas in Berlin.